Home > Financial News. Simplified. > Where Do Finances Fit In Your Relationship? If you remember this popular song by the Beatles, “Can’t buy me love”, there is irrefutable truth to it. Money alone cannot make you happy nor make someone fall in love but having money in relationship can definitely ensure happiness. In every stage of a relationship from dating to divorce, money plays an integral role which is overlooked. Failure to openly discuss finances and spending habits with our partners can lead to distress and divorces. In early phase of relationship, skipping the essential money talk does more harm leading to financial disagreements most post marriage. However, this can be avoided if both the partners openly discuss about their approach towards money. Relationships are strengthened with mutual respect, trust, love and understanding of emotional and physical needs. However, an annual Love and Money Survey conducted by TD Bank of America of over 1700 adults claimed that for a healthy and happy relationship, financial stability is necessary. And this can be achieved if the couples discuss their finances with one another regularly. As per the findings of that survey, nearly nine in 10 millennial couples (aged 18 to 34) reported being extremely or very happy in their relationships. About 60% reported discussing money with their significant others at least once a week. The data revealed that millennials were the most transparent, with 97% saying they discuss finances at least once a month, compared to 88% of couples across age groups. In recent times, even in India due to demographic changes with both the partners earning, there’s little time to spend together to discuss about anything. Hence, when neither partner is vocal about finances, having a financial stability is challenging. Our society has conditioned us in a way that discussing finances is almost taboo. But if you want your relationship to be happy and fulfilling, I strongly recommend that you discuss finances, spending habits, financial goals, etc. with your significant other. Here are five things that can get you started to find common financial ground with your partner. Start Discussing Early: Many experts advise that you should discuss it during the initial stages of relationship because it will help you to steer through financial disagreements. Since online dating is the trend, be extra careful and try to access the financial situation with small money talks. Know About Your Partner's Outlook Towards Finances: Knowing each other’s financial values, i.e. views on money, how you spend it, financial histories, and your priorities, and matching them up can be pretty tricky. If both of you have similar financial values, then you will be financially compatible for a happy and healthy future of togetherness. 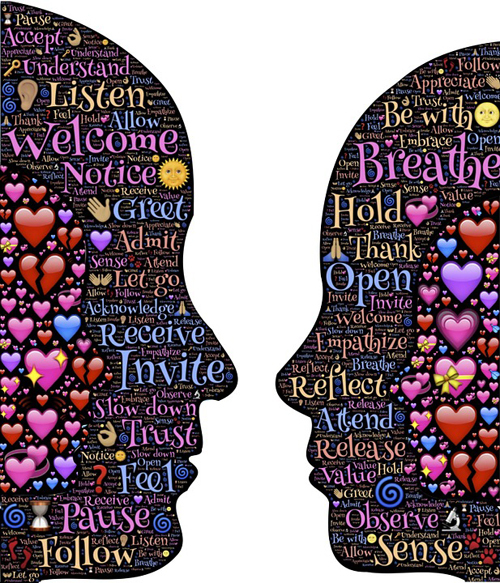 If one of you is from a family that is mindful about spending and is open to financial discussions, and the other one is completely opposite, it might put both of you at loggerheads over financial disagreements. 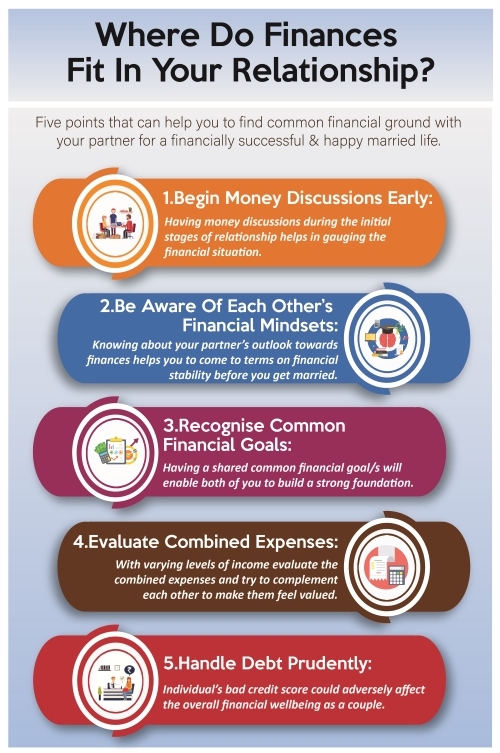 If you are aware about each other’s financial mindsets in advance, this will help find a middle ground on financial stability before you get married. Recognise Common Financial Goals: With growing fondness and increased level of comforts, knowing your partner’s financial goals will give you a cue of common financial goals. Having a shared common financial goal means both partners can start building a strong foundation for a financially successful happy relationship. Share the financial plans you have in mind to achieve those financial goals. If you have same goals and similar plans, then by combining it can help you reach them faster. Try To Complement Each Other: It would be ideal to find a partner with same levels of income because it is easier to share financial assets and responsibilities. But usually, the incomes of partners vary and sometimes there are clashes if one brags to make the other one feel petty. Instead, sit down together, evaluate the combined expenses, and agree on how much each partner shall contribute. Let your significant other know that you can contribute more if their income is lesser and value them for the other things they do. Assure them that it is “our money” and that they are equal and complement each other; this is what matters the most. Handle Debt Prudently: Ask your loved one about any pending loans and credit history. Have any of you been a defaulter in the past? If you decide to spend a lifetime together, disclosing such information can help you make informed decisions. If individual’s credit score is bad, this could adversely affect the overall financial wellbeing as a couple. When you transition from being single to being in a relationship (married), think and behave like a team. Because the ability to work toward achieving set financial goals as a team is vital to building a successful future together and the secret to a happy relationship. As with most things in a relationship where one leads the other, the money management expert can take care of monthly expenditures and roles can be reversed suitably. Having a healthy discussion about finances periodically with your partner is one of the most important factors that work wonders for your relationship and to keep you both happy. PS: If you want to add SOLID mutual funds to your portfolio to achieve a common financial goal with your partner, try PersonalFN's unbiased premium research service—FundSelect, it is meant to assist investors in selecting worthy mutual fund schemes.